Molded-in vertical divider slots on all sides allow you to create 1-1/4" compartments for protecting fragile parts. Recessed ledges permit stacking fully loaded containers without damaging contents. Injection molded of polyethylene construction. Compatible with most racks and shelving. Vertical divider color: black. 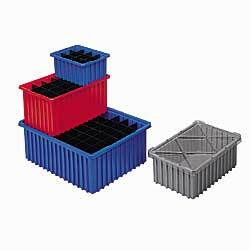 SPECIFY BOX COLOR: BL - Blue, GY - Gray, RD - Red. IN STOCK. XJ-914BL 18	 Blue	 0.16	 20	 10-7/8 x 8-1/4 x 5"
XJ-914GY 18	 Gray	 0.16	 20	 10-7/8 x 8-1/4 x 5"
XJ-914RD 18	 Red	 0.16	 20	 10-7/8 x 8-1/4 x 5"
XJ-934BL 14	 Blue	 0.29	 12	 16-1/2 x 10-7/8 x 4"
XJ-934GY 14	 Gray	 0.29	 12	 16-1/2 x 10-7/8 x 4"
XJ-934RD 14	 Red	 0.29	 12	 16-1/2 x 10-7/8 x 4"
XJ-915BL 13	 Blue	 0.44	 8	 16-1/2 x 10-7/8 x 6"
XJ-915GY 13	 Gray	 0.44	 8	 16-1/2 x 10-7/8 x 6"
XJ-915RD 13	 Red	 0.44	 8	 16-1/2 x 10-7/8 x 6"
XJ-916BL 16	 Blue	 0.59	 6	 16-1/2 x 10-7/8 x 8"
XJ-916GY 16	 Gray	 0.59	 6	 16-1/2 x 10-7/8 x 8"
XJ-916RD 16	 Red	 0.59	 6	 16-1/2 x 10-7/8 x 8"
XJ-935BL 22	 Blue	 0.61	 6	 22-3/4 x 17-3/8 x 4"
XJ-935GY 22	 Gray	 0.61	 6	 22-3/4 x 17-3/8 x 4"
XJ-935RD 22	 Red	 0.61	 6	 22-3/4 x 17-3/8 x 4"
XJ-936BL 17	 Blue	 0.96	 4	 22-3/4 x 17-3/8 x 6"
XJ-936GY 17	 Gray	 0.96	 4	 22-3/4 x 17-3/8 x 6"
XJ-936RD 17	 Red	 0.96	 4	 22-3/4 x 17-3/8 x 6"
XJ-917BL 14	 Blue	 1.30	 3	 22-3/4 x 17-3/8 x 8"
XJ-917GY 14	 Gray	 1.30	 3	 22-3/4 x 17-3/8 x 8"
XJ-917RD 14	 Red	 1.30	 3	 22-3/4 x 17-3/8 x 8"
XJ-937BL 12	 Blue	 1.66	 2	 22-3/4 x 17-3/8 x 10"
XJ-937GY 12	 Gray	 1.66	 2	 22-3/4 x 17-3/8 x 10"
XJ-937RD 12	 Red	 1.66	 2	 22-3/4 x 17-3/8 x 10"